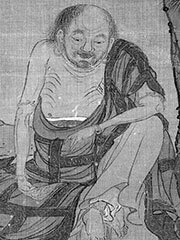 Dharmaraksa (Ch: 竺法护, Zhu Fahu) was one of the greatest translators of Mahayana Buddhist scriptures into Chinese. Scriptural catalogues describe him as of Yueh-Chih origin. His family lived at Dunhuang, where he was born around 230 CE. At the age of eight, he adopted the name of his master, an Indian monk named Zhu Gaozuo (Ch: 竺高座). His translated Buddhist scriptures are not only large in number, wide in class, but also broad in thought. His Buddhist thoughts cover many aspects such as ontology, phenomenology, psychology, and practice. As a young boy, Dhamaraksa is said to have travelled to many countries in the Western Regions and learned Central Asian languages and scripts. He then traveled back to China with a quantity of Buddhist texts. Dharmaraksa came to the Chinese capital of Loyang in 266 CE, where he made the first known translations of the Lotus Sutra and the Dasabhumika Sutra, which were to become some of the classic texts of Chinese Mahayana Buddhism. Altogether, Dharmaraksa translated around 154 Hīnayāna and Mahāyāna sutras, representing most of the important texts of Buddhism available in the Western Regions. The Saddharmapunnarnkasūtra(Ch: 正法华经, Zheng fahua jing). The Pancavimsatisāhasrikāprajnāpāramistasūtra (Ch: 光赞般若波罗密经, Guangzan boruoboluomi jing). The Danabhūmikasūtra(Ch: 渐备一切智德经, Jianbei yiqie zhide jing). The Lalitavistara (Ch: 普曜经, Puyao jing). His proselytizing is said to have converted many to Buddhism in China, and made Xian a major center of Buddhism.